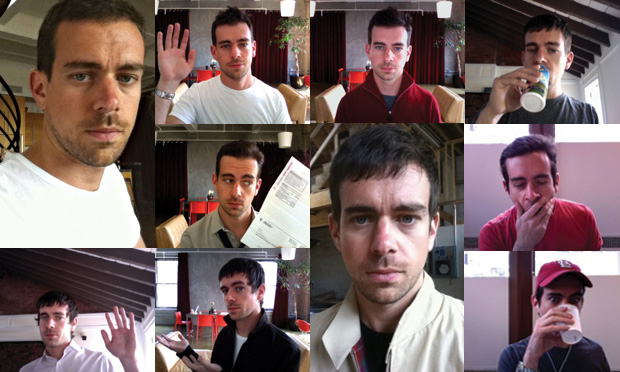 Dorsey’s quotidian existence seen through a collage of DailyBooth.com pics. If you’re addicted to crafting the perfect 140 character tweet haiku, you can thank–or curse–Twitter creator Jack Dorsey. The former taxi, courier and emergency services dispatcher–and current Twitter chairman and CEO of credit card payment company Square–believes there’s a universe in every tweet and that less can lead to so much more. Over a couple of conversations, we talked about how Twitter learned to use Twitter, how Britney Spears could be more inspiring to her 5.5 million followers, and what he thinks is next with social media. When you talk with the tech cognoscenti that you roll with, does the idea of influence and influencers come up? It’s certainly a liquid concept. Yet when the right idea is paired with someone who has a massive audience, the spreading can happen at a remarkable rate. But then if you look at The Influence Project–where there are nearly 30,000 people signed up, a vast majority of whom you’ve never heard of–there is this notion that the hoi polloi believe they exert some sort of influence. Do you see social media as an equalizer of sorts? It is interesting to think that maybe social media is not only democratizing communication, but also influence and the ability to influence. I do question whether people actually think that they are influencers, but I believe they see their potential. What’s interesting about Twitter and the influencers that someone follows–like say Shaquille O’neal–is that they see someone who is using the exact same tools that they have access to and I think that inspires this hope to be able to really engage with someone like him. So signing up with a service like Twitter and then following him and taking the next step to reply to him and then the next step where he actually replies to you or he retweets you and suddenly you’ve become an influencer. Suddenly you are picked up by this person you admire or follow and that just changes the dynamic and then you get more confidence around influencing others and you look for ways to do it. And what’s really interesting is that often times, when you’re looking for ways to do it, it doesn’t really produce any results. 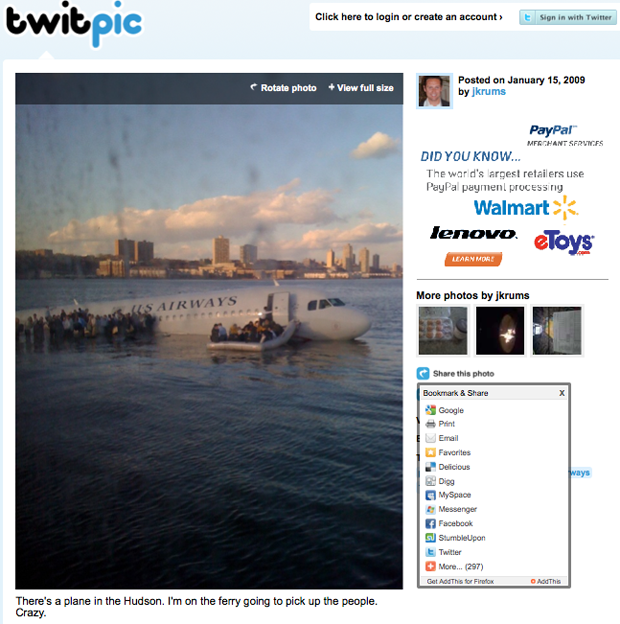 I imagine that the guy who took the picture of the plane in the Hudson wasn’t looking for ways to increase his following–he only had like twenty or thirty followers–or increase his influence, or for that matter probably wasn’t even thinking about Twitter at all when he captured the image. He just took a picture of a plane in the Hudson, then tweeted it out. Suddenly, he’s answered every one of his questions. It’s amazing the power of one tweet. Funny, before talking to you I tried to come up with some wonderfully tantalizing idea that would tickle your brain and I would tweet it and then you would retweet it and I would feel a version of that. Then in our first conversation, you mentioned Shaq, which led me to interview him for a post–that I sent to your assistant–and then you retweeted it. Yeah and I actually found out about the piece from the NBA retweeting it, not your email. They’ve been very successful using Twitter and I love following their company and the league. That’s how I found out about it. There is so much serendipity to this thing you created. It is interesting the way one collection of 140 characters can inspire a whole conversation, a whole interaction. The really interesting thing is that all the value, and all the interpretation, is controlled by the recipient. They bring the story and the substance to that message. Often times it’s easy to think about the individual writer or the content producer or the influencer, as having full control, but it’s actually the audience that’s making it a reality and bringing the value to it and extending the influence to their own networks. Business seems as confused about social media as they were when the Internet was introduced, does that ring true to you? I think to a certain extent it does because it’s so easy for anyone to produce content and it’s so constrained. The 140 characters concept is very important because it allows people to not really worry about composing themselves. It’s more in the moment updates of their thoughts and opinions. The content itself doesn’t have any solid direction, it’s open to interpretation and you can put whatever you want there. Other platforms require a lot more structure and more discipline and kind of put up all these barriers to produce content. It really speaks to the core essence of the brand or the person. And I think there are a lot of people, not just corporations, who are still trying to figure out what it means to them and how to use it effectively. (Laughing) I can tell you the guy who read that reply loves his Ford right now. It just engages you around the brand so much. JetBlue is one of the first to use us effectively and then Comcast used it famously. We’ve seen it a lot where a company instantly turns a perception around just by engaging their audience. But I also think a lot of corporations are afraid of social media because it forces a conversation many of them are not fully prepared to have. In the first couple of years, even Twitter was trying to figure out how to use Twitter effectively. We were building this communication service focused around transparency and immediacy and approachability, but we had all these downtime issues and we weren’t talking about it at all. We weren’t really telling our users what was going on because we weren’t really prepared for the conversation and we didn’t really think about the value our users might get out of it. Now we give full engineering details around exactly what is happening in the system and what’s going wrong and what fixes we’re putting in place. The engineering team has done an amazing job in using communication and its own influence to bring everyone into the circle and talk about our challenges. Comcast found the same thing. Jetblue found the same thing and it sounds like Ford is finding the same thing. There are all these opportunities to change perceptions just by engaging people on a human, face-to-face level. That’s scary, because it’s hard to admit mistakes and failures, but at the same time it’s an opportunity to reengage and really drive a lot of passion in whatever you are building. What do you think about this thing you created enabling what Old Spice and Wieden+Kennedy did, showing how multiple platforms can play in concert? The best part about this whole thing is we didn’t create a system thinking that this would happen. We created a simple idea and users took it on themselves to define it. Everyday we see something completely new. We saw early on that people were using it to stay in touch with friends. Then people were using it to stay in touch with the 2008 presidential election. Then celebrities. And then Iran and Moldova, and now more and more brands are using it creatively. It really speaks to the utility aspect of it, how anyone can define whatever they want to see in the system. It seems to be built around this notion that there aren’t any rules for it. That’s freeing, but seems to scare the hell out of those stuck in the status quo. People are starting to test with it. Some people are having other people experiment with it for them. Then they see people just doing it for themselves and getting massive results and having fun with it. I think it’s an evolution and everyone has to come to it with their own understanding and figure out their own value for it. I think its best when people, especially public figures, are updating it directly and don’t have staff around them. You can pretty easily tell when someone is genuine or being staffed. You’re talking about ghost twitterers right? Something that Guy Kawasaki defends to a degree–saying he’s a news aggregator, but clarifying that he personally responds to direct tweets. What do you think of that mix of ghost and direct interaction? What Guy is doing is curating what he finds interesting. He’s becoming the editor for what he is seeing, and I think that is very valuable. I think what Guy is doing is writing his own content; he’s just using other people’s words. What about Britney Spears? Is the relationship with her 5.5 million followers diminished by the use of ghosts? I think it would be a lot more powerful and engaging if she did it herself. Of course, I don’t know the effect of having her staff do it, but I know that if she were actually to write all the messages, I believe it’s more engaging. People can tell when it’s her and when it’s not. If a person sees her feed, or gets a tweet on their phone from Britney, and they know that she wrote it, it’s really, really engaging because, again, she’s using the exact same tools anyone can use. I can write a tweet and she could potentially respond to it. I know she might see it and respond to it or I can reply to her. That’s what gets people really excited about all these public figures on Twitter, the accessibility. And when they are on directly, it just inspires more. What do you think about the relationship between followers and celebrity and whether there’s a corollary for influence? It’s a really hard question to answer because it goes both ways. There are people with massive amounts of followers who are updating everyday who can’t influence much at all. They are talking about what they are doing during the day and articles they find interesting, but people are more interested in replying to them and interacting with them than following their links or their direction. But there are also times–like when the plane landed in the Hudson and the gentleman took a picture–when it becomes an international conversation and is seen around the world. There’s an entire universe in every single tweet and it all really depends on the content as far as how it’s going to spread. Do you try to read the tea leaves of social media? If so, can you share what you think is next? I’m less interested in how people are following each other and more interested in how they are following topics and tweets themselves. People are following more key words and concepts and more ideas and acting on those rather than individuals or organizations. We’ve made a very easy way to put content in, but getting content out in a real time and relevant way is still quite challenging. We have all this information flying through the network–like planes landing in the Hudson–but how do we immediately tell that that one tweet is important? How do we tell that that tweet is the one to highlight and really push. Technology needs to move to be more useful. Tell me more about identifying important tweets and zeroing in on the idea to give it the best opportunity to spread. Chomsky said: “information is entropy”, how does Twitter try to tackle that problem? I think that is the biggest challenge, not just for Twitter, but also for the technology industry, figuring out real time relevant ways to filter information. I think we are blazing ahead with location and companies like Foursquare and Gowalla are refocusing on how we can filter information down to a physical place. The momentum is not just around physical places, but items and things in that physical space and what our connection is to these things, how they connect us as humans. We’re going to see a lot with events as well. If you’re at Washington Square Park and you are there for a shared reason–like a concert or something else–being able to check in and share to an event like that helps filter and discover. Now when I’m at an event and take out my phone, I can actually see the events that are happening. That’s relevant to me because that’s the context I’m in. What’s interesting about Flipboard is that it’s very visual. Twitter is very text focused and you have to read it to get into all these things. What Flipboard does is take a link to an article or a picture and actually pulls and loads it so that you can see it in the tweet as well. It’s just there. When you start the application, a cool image becomes the cover. That just immediately grabs your attention and inspires you to learn more about it. So say the plane in the middle of the Hudson pops up, you’d immediately look at that content and retweet it and rebroadcast it and share it with your friends. And that’s how things spread so quickly. You get this very visual, visceral sense of what’s happening and you share it immediately.